The Venerable' Bede (c.672-735), wrote a number of commentaries on biblical books. In the New Testament are two groups of letters, known collectively as the Pauline Epistles (letters from St. Paul to the people of Rome, Ephesus, etc. ), and the Catholic Epistles (letters written by Sts. James, Peter, John, etc.). 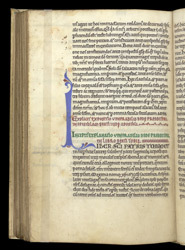 This page has the end of Bede's Commentary on Jude, and the start of the Commentary on Tobit. The initial 'L' is simple, but remarkably elegant, and the use of a line of green capitals between lines of red ones adds to the balance and harmony of the page.